The Pipestone Music Camp is a fun, high energy, intensive week of music education held at the Methow Valley Community Center. Running from Monday, July 31 through Friday, August 4, the camp culminates with a public performance on Friday, August 4 at 4pm in the Community Center gym. 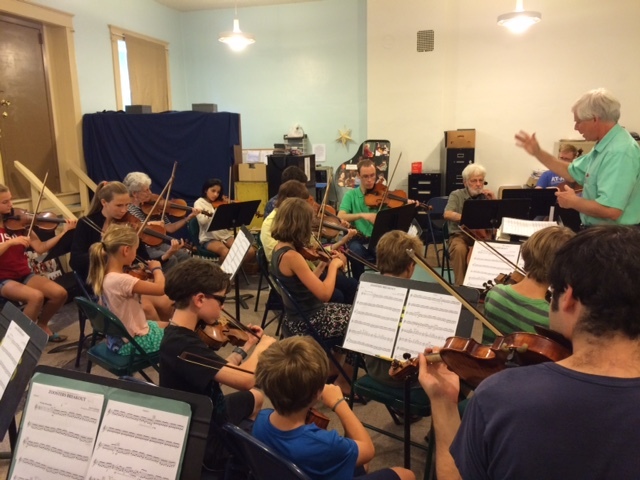 The String Orchestra section is held each day from 9:30 to 2:00, and is designed for children eight and older who have played at least one year and competently read music in first position. The Chamber Music section is held from 12:15-5:00 each day for students who have played a minimum of three years and read music fluently. This portion is open to strings, and piano. Guitar: Intermediate guitar classes are in the morning from 9:30 to 1:00. Advanced guitar is from 1:00 to 4:30. The music camp faculty is comprised of accomplished local and visiting musicians and dedicated teachers. Strings instructors are Pam Hunt, co-founder of the Pipestone School of Music and a registered Suzuki teacher; Michelle Vaughn, concertmaster of the Wenatchee Valley Symphony Orchestra; Jessica Jasper, violist from the Spokane Symphony; and Rachel Nesvig, orchestra teacher in the Edmonds School district, and a freelance violinist in the Seattle area. Terry Hunt, co-founder of the Pipestone School of Music, composer, teacher and performer will teach the guitar portion of the camp. The camp is scheduled during the Methow Valley Chamber Music Festival. This gives Pipestone students the opportunity to hear the Fellowship Quartet, the resident ensemble of college students sponsored by the Festival. They visit the camp for an afternoon giving a short recital, coaching and inspiration to the campers. The Festival also invites the camp students to attend one of the main stage concerts. DATE: Mon, July 31-Aug 4, culminating with a public performance in the Methow Valley Community Center gym Fri, Aug 4, 4pm. COST: $250/partial day enrollment, $350/full day. Deadline for registration and payment is July 1. Partial scholarships are available. CONTACT: Pam Hunt, 509-997-0222, cascadiamusic4u@gmail.com, www.cascadiamusic.org.